linking gardens with related local food system projects and policy. Denver Urban Gardens currently operates over 170 community gardens, including over 40 school-based community gardens. In addition, DUG operates DeLaney Community Farm (an urban community farm), the Master Composter Training Program, the Master Community Gardener Training Program, Grow a Garden, and provides extensive opportunities for youth education in nutrition and gardening. History: Denver Urban Gardens was established in 1985, in order to support Denver residents in creating sustainable, food-producing neighborhood community gardens. By 1993, DUG was the sole organization responsible for coordinating 21 active gardens, and by 1997, 32 new gardens and DeLaney Community Farm were established. Within the past decade, Denver Urban Gardens has created multiple ongoing youth and community education programs designed to facilitate community involvement and ensure long-term garden sustainability. 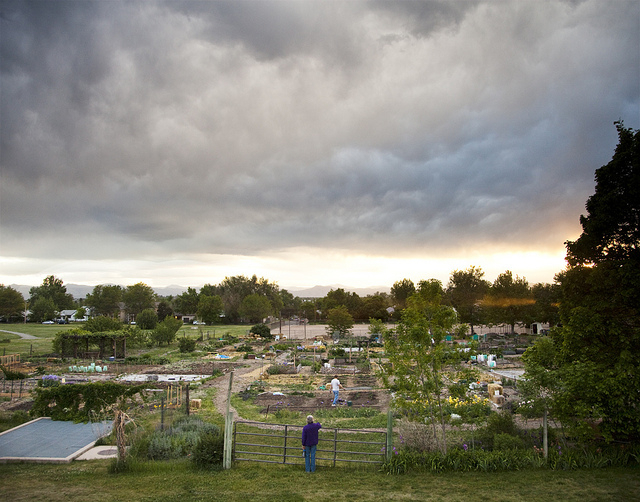 In the past 30 years, DUG’s network of community gardens has grown to well over 170, their youth education and community training programs have expanded to benefit thousands of underserved Coloradans annually, and research conducted in partnership with the Colorado School of Public Health indicates that DUG’s efforts have lead to tangible, positive change in community health and food security. Research: Gardens are good for neighborhoods! Click here to learn more about our Gardens for Growing Healthy Communities research initiative, which looks at how community gardens impact community health. If you are interested in receiving press updates from DUG, please fill out the form below.